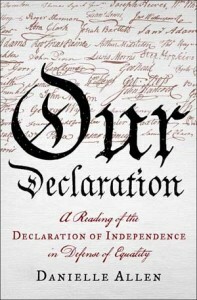 The Declaration of Independence is one of the world’s defining historical texts. Its words still resonate throughout the United States’ political and judicial systems, inspiring and influencing millions, both Americans and people around the world. But given its importance, how are so many of us unfamiliar with this document besides a very rudimentary understanding and rote repeating of “life, liberty, and pursuit of happiness”? Isn’t it time to take a deeper look at the context, both historical and literary, surrounding this powerful document? In “Our Declaration,” social-science professor Danielle Allen brings to life the 1,337 words of the Declaration of Independence. Going phrase by phrase through the document that changed the world and birthed a nation more than two centuries ago, Allen illustrates her teaching and examples through current pop-culture references and historical tidbits — perfect for the trivia lover, history buff or anyone who just wants to know more about how our country began. One particularly cool note Allen shares is how very slight tweaks or modifications were made to the Declaration in each version, depending on how the operator of the printing press formatted the document, showing the power of even printing press operators during this time period. Allen also includes her experience teaching the Declaration of Independence to two very different socioeconomic groups: elite undergraduate students at the University of Chicago and a class of non-traditional adult night students in the same city, a study in contrasts and also surprising similarities. If you are looking to be more informed on the cornerstone document of America’s history, this is your read. For more reviews by Molly Ford, visit SmartPrettyandAwkward.com.